When the much-touted Frankenstorm Sandy marched up the East Coast at the end of October, we had no idea the devastation the cat 1 hurricane would wrought on the densely populated Northeast Corridor. TVs blared warnings to New Yorkers, who on most days cast jaundiced eyes at predictions by authoritative prognosticators, to prepare for an apocalyptic weather event. 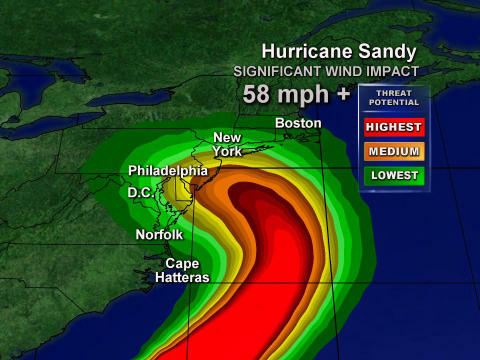 Hurricane Sandy’s Path up the East Coast of the U.S. Even the cantankerous Michael Bloomberg, the Mayor of New York City, took a minute for all the dire predictions of storm surges above 10 feet, historic coastal flooding in low-lying areas from Delaware to Connecticut, wind gusts of 90+ miles per hour and widespread power outages that could affect half of the power customers in the New York, New Jersey, Connecticut Tristate area, to sink in. The Mayor finally had his “come to Jesus moment” on Sunday and announced the unprecedented closing of the entire Metropolitan Transit System including subways, buses, trains, bridges and tunnels. 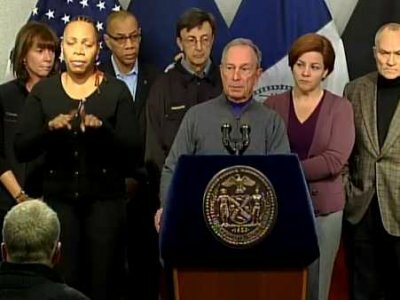 NYC Mayor Michael Bloomberg announces the mandatory evacuation of Zone A in Lower Manhattan. Bloomberg also called for the mandatory evacuation in flood zones in the City’s five boroughs moving 375,000 residents to higher ground. This was an extraordinary decision, one that had not been made in my lifetime, if ever, with far reaching consequences for the residents of NYC and the infrastructure of this bustling seat of power. President Barack Obama left the campaign trail to visit the storm-ravaged Jersey Shore with Governor Chris Christie on Wednesday, October 31st, two days after Sandy made landfall south of Atlantic City, NJ. Governor Christie, who gave the keynote speech at the Republican Convention and was considered a darling of the GOP and whispered to be a contender for the second spot on Romney’s ticket, had his former Republican fans experiencing buyer’s remorse because of his warm reception of the President of the United States during a time of crisis. 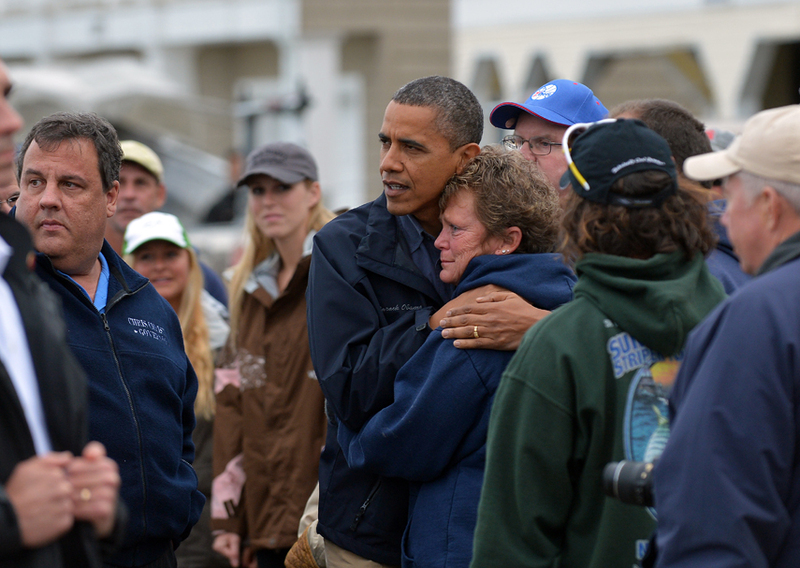 President Barack Obama comforts Brigantine, NJ resident during his tour of the devastated coastline with NJ Governor Chris Christie. The President listened intently and with compassion to the residents of Brigantine, a community on the south shore especially hard hit by Sandy. He reassured them that the Governor’s requests for assistance would be fulfilled by a quick response from the federal government. On Friday, November 2nd, “President Barack Obama declared Westchester County, a suburb of New York City, a disaster area, making the County eligible for federal aid. FEMA Recovery Teams were dispatched to Westchester to assist residents with losses they suffered during the storm. Sandy was a wake-up call for all of us here on the East Coast who experienced the ferocity of this natural disaster. I remember the devastation and the victims of the Tsunami, earthquake and nuclear disaster in Japan in March 2011; the earthquake in Haiti in January 2010; and Hurricane Katrina in New Orleans in August 2005. 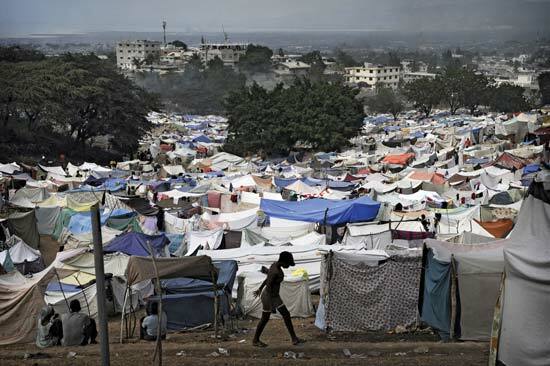 Tent City in Port-Au-Prince, Haiti was set up after the earthquake in 2010. I could not fathom then how these people were going to recover from these horrific events. Not all of them have, there are still tent cities in Haiti housing the victims of the earthquake; some residents in New Orleans in affected neighborhoods in the low-lying areas have returned to their homes, but many have been displaced permanently; and in northeast Japan where the nuclear power plant melted down, the residents who lived within a 12-mile radius have been evacuated permanently because of the high levels of radiation. Sandy, the Japanese tsunami, the Haitian earthquake and Hurricane Katrina are seismic weather events that are becoming more frequent and more intense as time goes by. 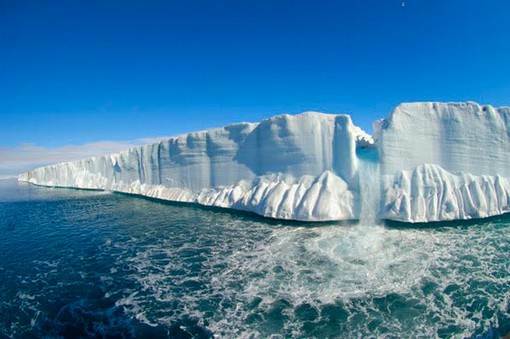 Global warming is causing the Polar Ice Cap to melt at an alarming rate. Clearly these climactic changes are a result of global warming – the seas are getting warmer and are rising, the polar ice cap in the Artic Ocean is melting at an alarming rate, and we are experiencing more extreme and severe weather, more often. What can we do to reduce global warming? We have to decrease the greenhouse gases that eat away at our atmosphere and create global warming. How do we do that? Use less energy by driving fuel-efficient or hybrid cars. Recycle items, instead of throwing them away and cluttering up the landfills. Plant more trees and gardens and create more green spaces to release more oxygen into the environment. And most of all, teach our kids the value of a clean, green and healthy community. This entry was posted in African American History and tagged Earthquake, Frankenstorm, Governor Chris Christie, Haiti, Hurricane Katrina, Hurricane Sandy, Japan, Mayor Michael Bloomberg, New Orleans, President Barack Obama, Tsunami. Bookmark the permalink.